What a year Weddings InStyle has had - and TRUST me when I say - we couldn't have done it without the help of our AMAZING vendors. Earlier this year Weddings InStyle was awarded Top Venue in Ottawa, in all of Ontario, for all of Canada and we placed 3rd overall in the world. There was no Judging Panel - Instead of appointing an arbitrary panel of judges to pick winners, the Wedding Industry Experts Awards was a true peoples choice Award. Anyone was able to vote for the vendors they loved. The results showed who was the most popular choice in each category by city, state/province, country and internationally. We were VERY thrilled that our couples, fans and vendors took to voting and we took top prize across the nation. 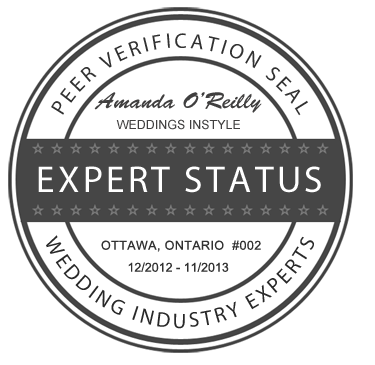 The Wedding Industry Experts approached us earlier this month to participate in a trial call "Expert Status" Peer Verification. 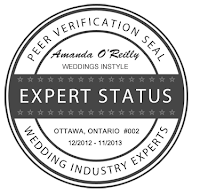 Expert Status makes it easy for couples to identify respected wedding professionals in their local area. This will be GREAT for the wedding industry when it rolls out next year. You won't have to guess what dealing with your wedding vendor will be like because you will be able to find out before you sign on the dotted line. There are so many things that could be taken into consideration when determining if a person deserves Expert Status. Is a person an expert because of their credentials, their training and education, their professional memberships, their publications, their level of experience - or a combination of these? Seems that EVERYONE is a wedding planner a wedding photographer, videographer or in an expert in something wedding these days. But are they really???? The Weddings Industry Experts thought one of the best way to determine in a wedding service provider is an "expert" is to ask other Wedding Profressionals who have personally worked along side them at weddings. Those who see time and time again what goes on behind-the-scenes, and those who have the same clients are often in the best position to judge. Some might think twice about being reviewed by industry peers - we were happy to oblige the process. We didn't blink an eye and handed over OUR "Little Black Book"
They contacted 10 of our vendors and asked them the following to determine if WE at Weddings InStyle deserved the Expert Status seal. Excel in all aspects of their profession. Have a positive, professional attitude and is well presented. Honor agreements made with clients and suppliers. Present our qualifications and expertise accurately. Communicate effectively and return calls and emails promptly. If a dispute arises, we resolve it quickly in a professional, courteous manner. We have just been vetted by some of Ottawa's industry's best. Wedding Industry Experts independently contacted 10 of our vendors, and they all confirm that they agree (to the best of their knowledge), that we at Weddings InStyle meet the requirements and have all the criteria for Expert Status. Check out our site here. A BIG thank you to all our WONDERFUL vendors who spoke so graciously about us! We LOVE working with each and every one of you and that's why EVERY event we do together is ALWAYS InStyle! Not booking your wedding with us but need a referral? No doubt we have AMAZING vendors and would LOVE to tell you about them! As always, if you want to follow what we are up to come join the fun on Facebook or better yet come see us in person! We'd love to meet you! Until next time ... Happy Holidays and see you in 2013! Hello. Facebook takes a [url=http://www.onlineblackjack.gd]online blackjack[/url] lash on 888 casino furnish: Facebook is expanding its efforts to tip real-money gaming to millions of British users after announcing a sell with the online gambling toss 888 Holdings.And Bye.